Cohen was born in Westwood, California, a neighborhood in Los Angeles. Her mother, Galina Feldman, is a Jewish immigrant from Ukraine and a former ballet dancer; her father, Roger Cohen, is a Jewish American business consultant who used to practice law. Her sister, Natalia ("Natasha"), began college at Barnard College in August 2006. 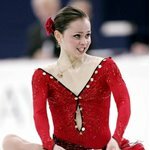 A gymnast from an early age, Cohen switched to figure skating when she was seven years old, but it wasn't until she was 10 that she began to take the sport seriously.